I think this is the fifth year straight we have gone to Disneyland during the Christmas season, which in terms of Disney, stretches from about Veteran's Day to New Years Day. Every year I gather a wealth of information and plan to write about it, and year after year passes and it all just gets too busy and I fail. It's been about 6 weeks since I posted. I know I touched on it before but here were the circumstances. This was the continuation of our trip with my mother in law and my sister in law and her family which started in Las Vegas a few days before. We left Vegas on Sunday morning at 645 am to arrive back in San Jose at about 8:30 am. We dumped out our bags and repacked and were on the road to Anaheim by 10 or so. We were joined there by the rest of the family that had driven from Vegas and one brother in law that flew in from West Virginia. The other brother in law in San Diego was preparing for hosting Thanksgiving and never made it, so our bunch was 10. 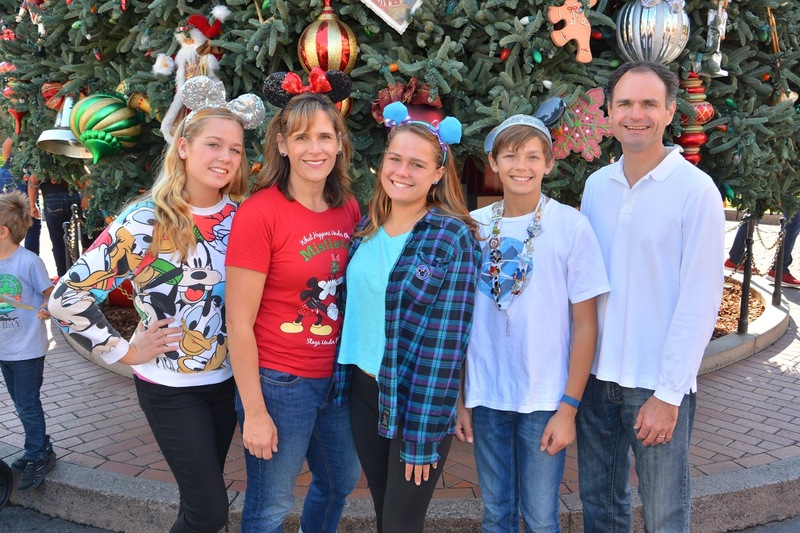 So what's so great about going to Disneyland during the holidays? Well there is no doubt we have seen some mighty wicked crowds during this time. This time we . wound up there the Monday of Thanksgiving week, and I would be hard pressed to say that this was not the busiest we had seen Disneyland, given when we usually go. The stand by line for Haunted Mansion in the middle of the afternoon was 120 minutes and there was actually a line to get back in with your fast pass. On this day we actually had to watch the line at the Monorail to make sure we made it to our dinner reservation at the Disneyland Hotel on time! Tuesday was about 30-40 % better if I had to take a stab at it. Last year we went the WEEKEND before Thanksgiving which coincidentally turned out to be the same weekend the "Season of the Force" opened in Tomorrowland, and that was about as crowded as Tuesday this year. Most of the years we have gone we wound up going the weekend before the weekend before Thanksgiving. Once we went on a rainy first weekend of December, and this was by far the best. again, the instant you are allowed, send the runner. Effective use of the FastPass system may require some traversing of the park, but I think it's worth it. We will usually use our time waiting for our next FP window to wait in lines at non-FP rides, which this time were at worst about 40 minutes (Jungle Cruise). A couple more tricks for time saving: 1) watch the fireworks from BEHIND the castle. OKAY-it's not quite the same--it's not the classic Disney picture of the castle with the fireworks behind, but it's nearly as beautiful behind Small World. 2) Watch the later night parade, as a lot of people leave after the fireworks. In both of these cases, you save a lot of ride time as you can literally run up to your spot just before show time. I could also give you some advice about knowing which direction the parade is heading and planning your spot stake out accordingly but you have heard enough from me about managing time. NOW this all being said--these tips do not apply in Walt Disney World, where the FP system is completely different. There are three rides that are decorated specially for the holidays. For this reason the wait times at these rides are generally longer than they would normally be. IT'S A SMALL WORLD changes to a display of children worldwide celebrating Christmas. Though I noticed that none of the costumes on the children change (that would be a lot of costumes, as there are about 300 characters), each child holds or wears something additional, a gift, and ornament, a garland, a hair ornament, that makes that child Christmasey. 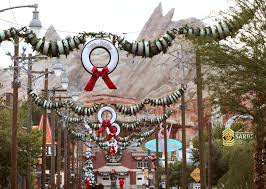 In addition, festive banners in native languages, trees, stars, fireworks and other detailed decor transform the surroundings to a Christmas wonderland. The final salon, which as always shows the children united in song, is particularly festive all dressed in winter white. And for all you scrooges who hate this ride for the obvious reasons, the kids take a break from singing "It's a Small World," to sing us "Jingle Bells" in native languages, a refreshing change. Also particularly beautiful are the red and gold lights that illuminate the ride at nightfall. The Jungle Cruise becomes the "JINGLE CRUISE." The ride runs its same course and includes its usual litany of puns which are now geared to the holidays. Lots of decor changes suggest the natives are decorating a totem pole, the hippopotamus has eaten a fruitcake and that the jungle animals are "playing with" Santa's reindeer. It's a hoot. The puns make me laugh out loud. I am the only one laughing. Everyone must think I'm a complete idiot. "When getting out watch your step and watch your head, but if you miss your step and hit your head then watch your language..."
Perhaps my favorite is the HAUNTED MANSION HOLIDAY. Apparent this ride gets decorated into a "Nightmare Before Christmas" theme for Halloween in October and stays the same throughout the Christmas season. Jack Skellington and some of the other characters make an appearance throughout the ride, including in the complete holiday revamp of the preshow in the stretching room. Lots of decor crossing the line between Christmas and scary, like a wreath with big sharp teeth and a cemetery covered in a blanket of snow. I find it to be mostly colorful and clever rather than scary. I actually prefer this version of the ride to the original. The two specifically Christmas shows at Disneyland are the "A Christmas Fantasy Parade" twice daily and the nightly "Believe...in Holiday Magic" Fireworks Spectacular". Disney's California Adventure has the "World of Color--Season of Light" twice nightly. We have seen the first two so many times we have nearly memorized them. World of Color we have never seen. Quite frankly, the night shows at Disneyland park are so fabulous that we can't bear to tear ourselves away and make the trek over to DCA to sit there in a crowd, all the while missing a change to see the Paint the Night parade one more time. More on that later. A Christmas Fantasy Parade runs twice daily, and has been doing so since 1994!. It runs from Small World down to Main Street at 1:30 and then back again at 4:15. It's a sweet parade. 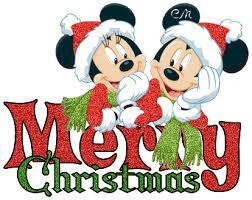 Disney characters are featured on floats depicting different Christmas scenes. Woody rides a rocking horse, the princesses attend a candlelight Christmas ball, and Minnie and Mickey manage Santa's mailroom with Chip and Dale. In addition to all this is the usual Disney parade magic--shiny toy soldiers, men "skiing" on roller skates, dancing snowmen, all accompanied by a catchy tune that I think even my husband can hum on cue by now. It is a little funny to watch this parade in the middle of November. I kid you not, I watched this parade in 80 degree whether once, during which I wondered if Elsa would finally thaw. and holiday type songs of course accompanied by the choreographed fireworks show. The simulated snowfall on Main Street (it's soap bubbles I figured out) after the finale makes this event particular magical. People sit and wait in front of the castle for hours but we always slip under the rope about 20 minutes before the show. No big. Show still enjoyed. Why waste all that time? One thing I should mention is that they do tend to warn several times that due to high winds the show might be cancelled. They did this both nights this year and also in the past, but I do not remember the fireworks ever being cancelled. 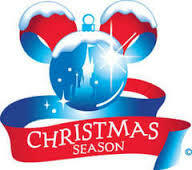 Closer to Christmas..I do remember this happening the year we went in December..Disney arranges special holiday events. One year there was a candlelight procession down Main Street. 100's of carolers processed in rows of 10 or so, shoulder to shoulder, wearing choir robes and holding candles, while singing traditional CHRISTMAS (notice the caps) carols. It was stirring. Five years later I can't think about it without getting a little misty. Not exactly Christmas, actually not Christmas at all, but I have to take a little time to talk about the "Paint the Night" parade. The Paint the Night parade began in Hong Kong in 2014 and debuted in Disneyland in May of 2015 as part of Disneyland's 60th anniversary celebration. Apparently its last regular run was in September of this year, but it ran twice nightly while we were there. I have heard that there is no plan for the parade to run at all past January 8, 2017, and that Paint the Night will be replaced by the Main Street Electrical Parade. Learning this is a huge disappointment. This parade is SO FUN! It is almost impossible to NOT get up and dance and sing along. The two years we were able to see it we watched it both nights at 10:30 pm. This parade is a literal party of lights and music and everyone's invited: Jessie, King Triton, Slinky dog, Lightning McQueen, Belle, Buzz Lightyear and of course Mickey Mouse. I would say if you haven't seen it go now cuz it doesn't look like it's gonna be around much longer! Boo-hoo! Really a huge part of the excitement of this time at Disneyland is just the huge amount of detail that Disney puts into the conversion of Disneyland and DCA into a Christmas wonderland. Everywhere you turn are garlands, bows, wreaths, lights, bells, snowflakes, decorated trees, and just about anything else you can imagine that would make you think of the holidays. No eave, lamppost, or storefront goes ungarnished. Particularly fun are the whimsical car themed Christmas decorations of Cars Land in DCA, in which tire wreaths hang from garlands of oil filters, orange cones are strung with lights and a huge tree is adorned with hubcaps. It's super clever and just about the only entire land in themed decoration. There are PLENTY of family Christmas photo opportunities all over and plenty of photographers willing to take pictures of your family, even with your own cameras. 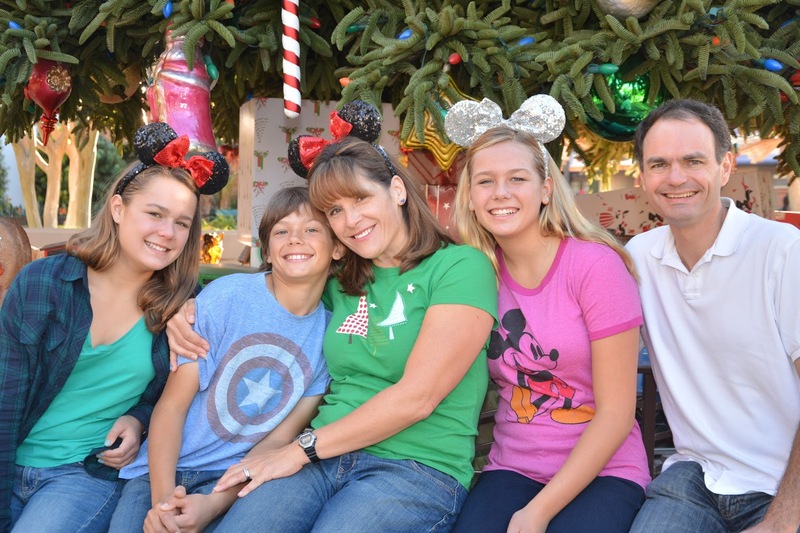 The last two years, our Christmas photos were taken in Disneyland by Disney photographers. The Disney Photopass system makes in easy to download images and use them with whatever photo service you desire! Well after five years I finally got this post done! I hope you enjoyed reading it! And now for some pictures!